The expression "skinny as a rail" comes from the fact that all rail species can laterally compress their bodies and walk through the marsh without moving a blade of grass. The Virginia Rail is a reclusive bird of fresh and saltwater marshes, and is usually seen only when it comes out to feed on mudflats. It breeds in marshes from southern British Columbia to Nova Scotia, south to Baja California, and along the mid-Atlantic coast, with scattered nesting inland. In winter, it is primarily found along the coastlines from New Jersey and southern Canada to Mexico, and scattered locations inland. In Tennessee, this rail is a rare permanent resident, and an uncommon migrant, primarily in Middle and East Tennessee. Description: This small, chicken-like marshbird, has a long, slightly curved red bill, short red legs, a short up-turned tail, a gray face, chestnut colored throat and breast, and barred black-and-white flanks. Voice: The call is a distinctive series mechanical kid kid kidick kidick phrases. King Rail, also rare in Tennessee, are similarly marked, but are much larger, with paler legs and bill, and cheeks not distinctly gray. Habitat: Marshes, usually freshwater, with dense emergent vegetation, such as cattails, sedges, and rushes. Diet: Insects, insect larvae, other aquatic invertebrates, fish, frogs, and small snakes. Nesting and reproduction: The Virginia Rail builds numerous "dummy nests" in addition to the one where eggs are actually laid. In Tennessee, they have been found nesting in marshes 8 to 20 acres in size. Clutch Size: Usually 8 to 9 eggs, with a range of 4 to 13. Incubation: Both adults incubate for 18 to 20 days. Fledging: Young leave the nest within 2 to 3 days of hatching, and are brooded in a specially built nest, constructed by the male, near the original nest. Both adults care for the young for at least 3 weeks. Nest: Both adults build the bowl-shaped nest of loosely woven marsh vegetation, often with a canopy, usually placed above shallow water. Tennessee nest heights range from 3.5 to 10 inches above the water. Status in Tennessee: This rail is rare but regular in Tennessee during migration, and is a rare nesting and wintering species, primarily in Middle and East Tennessee. It usually arrives in the state in early April and departs by early October. 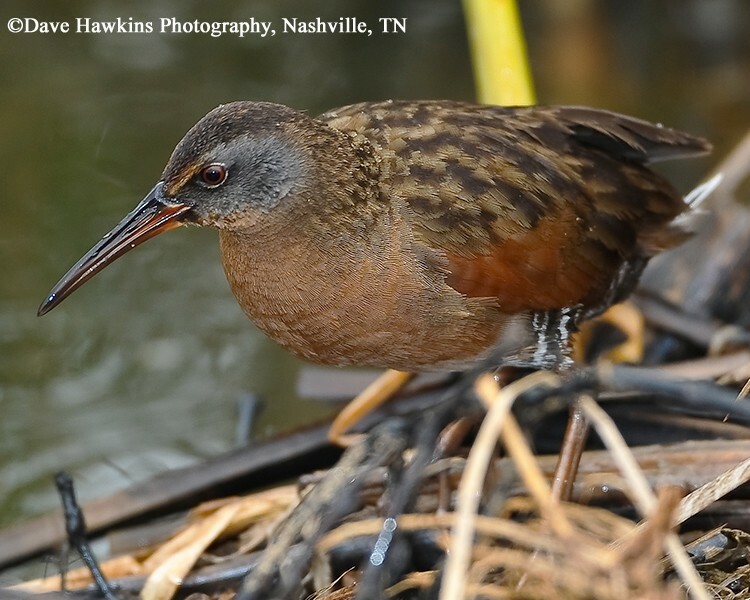 Although the Virginia Rail is considered a game species in Tennessee, as well as throughout North America, hunters seldom take it. The Virginia Rail has modified feather tips on its forehead to prevent feather wear as it pushes its way through dense marsh vegetation. When threatened, the Virginia Rail, like other rails, prefers to escape by running through marsh vegetation rather than flying. When forced to fly, it will only fly a short distance. Regardless of its apparent weak flight, it migrates long distances each year. Best places to see in Tennessee: Easiest to find in spring by vocalization. Can be found in half acre to larger marshes in Middle, but especially East Tennessee. Specific breeding locations include: Alcoa Marsh, Blount Co., Goose Pond, Grundy Co., Standifer Gap Marsh, Hamilton County, and recently the Tennessee Nature Conservancy's Quarry Bog in Shady Valley, Johnson County. Conway, Courtney J. 1995. Virginia Rail (Rallus limicola), The Birds of North America Online (A. Poole, Ed.). Ithaca: Cornell Lab of Ornithology; Retrieved from the Birds of North America Online.